General Description: Peace and Aloha is a "Bougainvillea 62" designed by Chuck Paine and built by Kanter Yachts of welded aluminum in Ontario, Canada. Key dimensions are: LOA: 62', LWL: 56', BEAM: 15 1/2', DRAFT: 6'9", DISPLACEMENT (1/2 load): 47,000 lbs, SAIL AREA (100% foretriangle): 1,400 sq ft. It is a cutter-rigged sloop with an aft cockpit and fully enclosed pilot house. 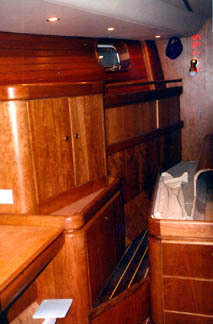 The main features of this design that we are particularly attracted to are: watertight bulkheads forming three watertight compartments for crash protection, separate engine room that keeps the heat and diesel fumes out of the living areas, extremely long waterline for fast passage making, aluminum construction for strength if running aground, enclosed pilot house for better comfort during passages and bad weather, the ability to be sailed single handed, beautiful appearance, and we could go on and on---. The rig is configured to be shorthanded sailed with full roller furling on the genoa and staysail. The main sail is furled into the boom using Leisure Furl technology. There is an extendable bowsprit forward which allows better setting of the asymmetrical spinnaker for broad reach performance. All wenches are electric powered with an extra wench forward of the mast for utility work. The working sails are made of Spectra SX25 and SX35 and the spinnaker is of 1 1/2 oz nylon. Ground tackle includes a single Bruce 176 lb anchor with 400' high test chain and an Fortress 80 lb backup stored forward and another Fortress 80 lb anchor stored aft with their own rodes. A Maxwell 3500 windless is located about the chain locker at the bow. A 24' diameter parachute sea anchor is also stored forward for extreme storm conditions. Pilot House and Electronics: The pilot house consists of a navigation station and a seaberth/settee with folding table opposite the navigation station. Steering by auto pilot and navigation can be accomplished within the pilot house and it is only necessary to venture out into the elements to adjust the sails. The pilot house electronics include: VHF radio with hailer horn, Northstar 961XD chart plotter, Autohelm Navplotter 100, Raytheon R41XX radar fully GPS interfaced, two switchable separate Raytheon ST6000 hydraulic auto pilots with remote controls in the pilot house, cockpit, and forward of the mast which is interfaced to GPS and chart plotter. The sailing instruments include wind, depth, steering compass, and speed in various configurations with readouts in the cockpit, pilot house and owner's cabin. All of these systems are interfaced via Seatalk. Also located in the pilot house is a forward looking sonar and a radar detector. 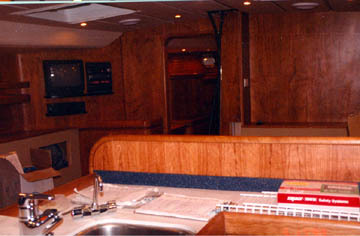 Interior and Systems: The owner's cabin is forward of the mast and contains a queen size berth, hanging closet, head with separate shower, various cabinets, book shelves, and an office/communications area. The electronics at this location include a SSB marine and ham (David's amateur radio call sign - KH7JL) radio combination, Inmarsat C satellite text communication system for E-mail, weather advisories, and emergency communications, weather fax via SSB and PC, and office laptop PC for ship's log and business. The galley contains a double sink, top and side access refrigerator, general purpose freezer, three burner propane stove with oven, microwave, various drawers and storage compartments, and a larder (pantry). 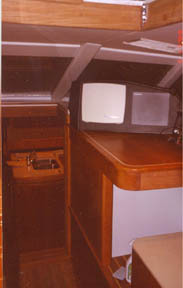 The starboard aft cabin (Julie's) contains a double bed size berth with closet. The port aft cabin (Eric and Jason's) contains separated berths for each person, hanging wet locker and other lockers and access to the main cabin head. Access to the engine room is through this cabin via a watertight door. Access to the engine room can also be made from the cockpit. Between the two aft cabins is a 1350 amp hour battery bank made of of 6 volt golf cart batteries. We have given up on gel cells and have had much better cost/performance from deep cycle lead-acid technology. Engine room: The engine room contains a 140 hp Yanmar diesel with a Max Prop folding propeller attached to the drive shaft, 10 kW diesel generator, 600 gallon per day water maker, 12 volt compressor for the freezers and refrigerator, high capacity electric bilge pump ducted to each of the watertight compartments, water heater operated by engine heat and electric, and a small work bench. Hot and cold water is piped to all heads and galley via a pressure tank and pump. There is an automatic fire extinguishing system in the engine room and there are fume detectors to give alerts to the presence of CO and propane in the interior. The ac electrical panel in located in the engine room with an isolating transformer for use by shore power. There is a galvanic isolator on the transformer also. Both 110/220 volt 60 cycle and 240 volt 50 cycle shore power can be brought into the engine room via external electrical plugs. Under Cabin bunks: Two 2500 watt battery chargers are located under the starboard aft cabin and provide for both charging and 110 ac inverter operation. There is a 240/50 cycle battery charger located under the port cabin which provides batter charging using 240 50 cycle shore power. This charger also provides 240 50 cycle ac power to the TV and VCR which are universal-world-wide capable (a powered TV antenna is located on the radar tower). There are three reverse cycle air conditioning and heating compressors under the aft port cabin, forward cabin, and in the main sitting area. 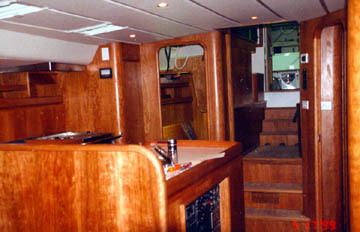 Cockpit and surrounding area: The cockpit area contains hatches to storage areas including 4 - 20 lb propane tanks, electric wenches and jammers for sail handling, steering wheel, and sailing instruments. The transom contains a deflated inflatable dinghy garage. The outboard motor is stored in the watertight rudder compartment and is accessed using a small crane off the radar/antenna mast aft of the cockpit. There is a permanent cockpit bimini which is hurricane proof with four solar panels mounted on top. A wind generator has also been added. The combination of engine generator, separate diesel generator, solar panels, and wind generator give all the electric power capability and redundancy equired for extended passage making and exploration. Safety equipment: A Givens 8 man life raft is stowed in a cockpit locker. Man over board pole, light and sling is stowed on the aft rail. A full complement of flares and signaling equipment is available. The abandon ship bag contains water, food, signaling flares, RO water maker, first aid kit, instruction book, blankets, vitamins, etc. A fully provisioned medical kit is aboard containing all varieties of medicines, prescription and over the counter drugs, and medical equipment and books of instruction. A 406 EPIRB and hand held VHF radio are also available for use in emergencies along with the emergency communications ability of the Inmarsat C satellite communications system. The final item of safety includes a 24' diameter sea anchor and associated rode and tripping line for survival types of storms. The type of construction (aluminum) gives good safety and shelter in lightening storms. 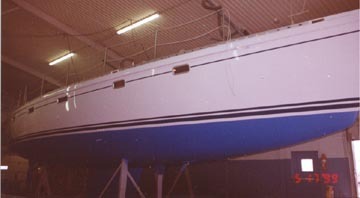 The narrow beam and sufficient ballast in the wing keel gives the boat a good curve of stability and adequate righting moment for severe knock downs. The use of interfaced GPS and radar with chart plotters also lends greatly to the safety of navigation in bad weather. Finally, David has his 100 ton Master/Mate Coast Guard Captain's license which gives us all a small increase in assurance that he knows what he is doing! Origin of the name Peace and Aloha: Some of you may wonder where we obtained the name of our boat. The following may or may not be of interest to you, but it may satisfy a curiosity. Peace and Aloha represent Elohim of the Sixth Ray and have their etheric retreat over the Hawaiian Islands. Definition - Elohim: One of the Hebrew names of God used in the Old Testament about 2,500 times, meaning "Mighty One" or "Strong One." Elohim is a uni-plural noun referring to the twin flames of the Godhead that comprise the "Divine Us." When speaking specifically of either the masculine or feminine half, the plural form is retained because of the understanding that one half of the Divine Whole contains and is the androgynous Self (the Divine Us). The Seven Mighty Elohim, of which Peace and Aloha are one pair of divine complements, are the "seven Spirits of God" named in Revelation and the "morning stars" that sang together in the beginning, as the Lord revealed them to His servant Job. The intonation of the sacred sound "Elohim" releases the tremendous power of their God Self-awareness stepped down for our blessed use through the Cosmic Christ. 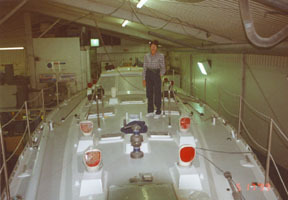 Peace and Aloha being built at Kanter Yachts in St Thomas, Ontario Canada May, 1999. The differences from this diagram from our boat layout is that the starboard aft cabin is a double horizontal bunk and the access to the engine room is via the port cabin. Also, the engine is more aft with a V-drive. Everything else is very similar.